The crab barnacle, hitchin’ a ride. 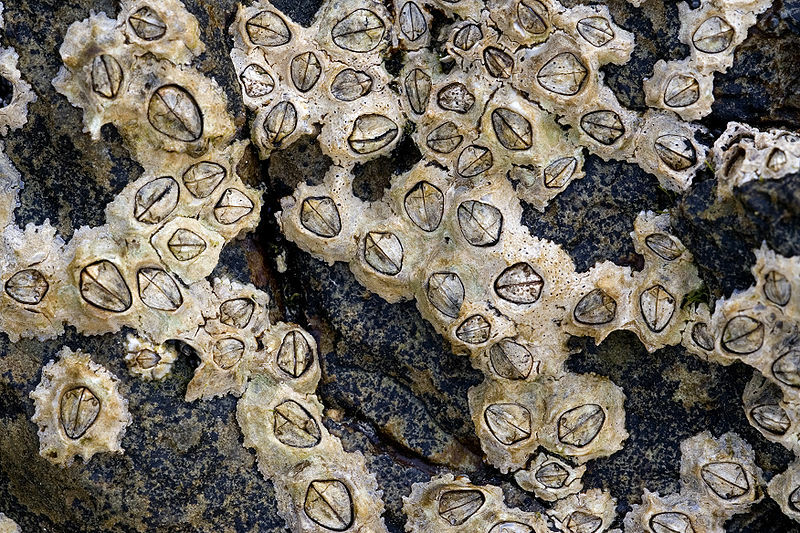 Most barnacles, those almost quaint crusts seen decorating old piers and ships, live their lives by cementing themselves to a hard underwater surface and using their arm-like limbs to pull passing bits of food into their mouths all day. Not so for the crab barnacle, who decided that all that arm-waving was for chumps and set about evolving into the ultimate free-loader. In its immature larval form, Sacculina has a similar body plan to other barnacles and is able to swim about freely; however, rather than finding a surface to settle down on, it finds itself a crab. Typically, this will be a green crab, species Carcinus maenas. The female barnacle (more on the males later) crawls along the surface of the crab’s shell until she comes to a joint – a chink in the armour – where she turns into a sort of hypodermic needle, injecting herself into the crab and leaving her limbs and shell behind. Now nothing more than a tiny slug-like mass, she makes her way to the crab’s abdomen and proceeds to grow rootlike tendrils throughout her host’s body, drawing nutrients directly from the bloodstream. If that wasn’t disturbing enough, consider Sacculina’s mode of reproduction. 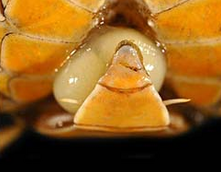 In addition to its internal root system, the parasite forms an external sac (hence the nickname ‘crab bag’) where the female crab normally keeps her fertilized eggs. This is where the male barnacle comes into play. 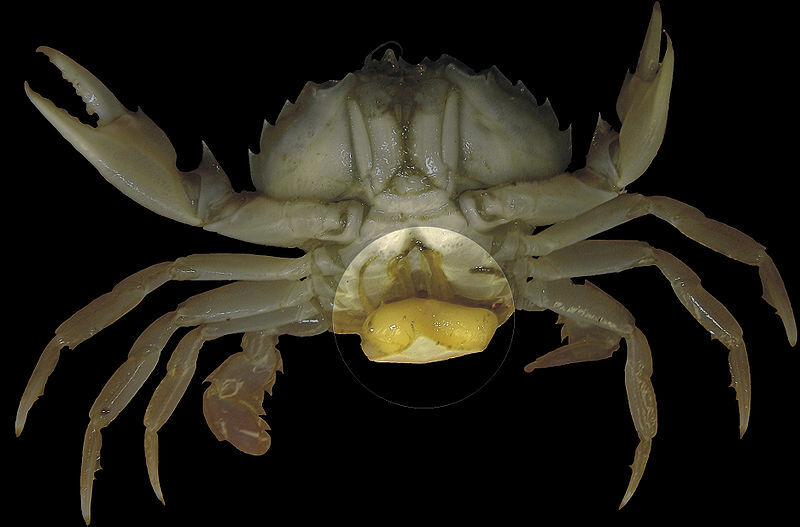 Upon finding a crab already infected by a female, the male will do the same needle trick, injecting himself into the external sac and living for the rest of his life as a parasite inside the female’s body. Fertilization takes place and the sac is soon full of microscopic Sacculina larvae. In case you needed a closer look. Since the barnacle infection has rendered the host sterile, and because crabs aren’t very bright, the crab will now care for this sac of larvae as if they were her own young. But what if the infected crab was male, you ask? No problem. The parasite is able to interfere with his hormones to such an extent that, in addition to changing his body shape to that of a female, he now actually behaves like, and even carries out the mating gestures of, a female crab. Now, this may not seem so bad from the point of view of the crab; I mean, it doesn’t know it’s carrying around evil changeling spawn, right? But it’s a bit worse than that. Wanting to keep all the available energy for its own use, the parasite prevents the crab from moulting its shell or re-growing lost claws, as crabs normally do. This leads to a variety of secondary infections which, coupled with malnutrition, leads to the premature death of the crab. But nature isn’t without a sense of fair play… research has now found that Sacculina sometimes succumbs to viruses and yeast naturally present in the crab’s body, via infection of its rootlets. Take that, bloodsucking barnacle! Powell & Rowley (2008) Diseases of Aquatic Organisms 80: 75-79.
Zimmer (2000) “Do parasites rule the world?” Discover Magazine (August issue). Russell et al. (2000) Journal of the Marine Biological Association of the U.K. 80: 373-374. Mouritsen & Jensen (2006) Marine Biology Research 2: 270-275. Goddard et al. 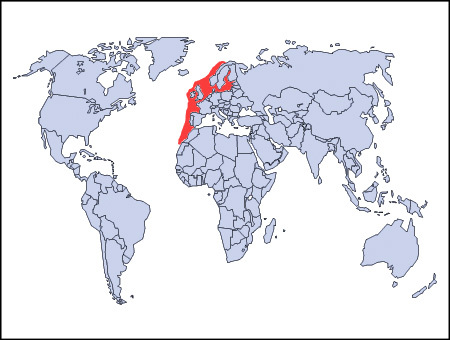 (2005) Biological Invasions 7: 895-912.